Back by POPULAR DEMAND!! The original 1981 recording of "JET PILOTS DON'T USE REAR VIEW MIRRORS!" by Joel Weldon, first heard on American Airlines as a "Business Seminar in the Air." That year American Airlines received over 2500 letters of thanks in response to this message! It's chock full of timeless truths on looking ahead, not back! "Joel is outstanding. I first heard this while I was flying in the 80s on American Airlines. I am a neurosurgeon and his positive honest message and inspiring motivation helped me do even more." "Joel, thank you. I recently went through a rough period where I needed some guidance. My parents bought me your Build a Better You series, and after listening to you 3 times all the way through (now on my 4th), I have made many positive strides in my life, changed my profession, lost 31 lbs, in a very happy positive relationship and can honestly say I am happy with myself. Where the real Thank You comes in to place is this past weekend. My little brother was in a rough spot, so I gave him some brotherly advice and lent him some of my CD's (Attitude in Action & Focused Thinking). Joel, this was his status update yesterday: Thanks to my big brother I can start tapping my potential, and If it is to be its up to me.. Ingredients: Commitment, Courage, Faith, Imagination, Creativity, Honesty, Persistence, Knowledge, Defined Values, Focused Thinking, a Sense of Humor, and a Positive “I Can” attitude. 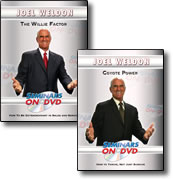 Two of JOEL WELDON'S best-loved seminars... Now available on DVD! Come along with Joel to Memphis, Tennessee on his taxi ride with Mr. Willie Cooley, cab driver extraordinaire, and get set for 12 important ways you can use “The Willie Factor” to be amazing in sales and service! "Coyote Power" means you can THRIVE, not just survive! The Coyote is proof that adaptability, teamwork and courage are the keys to overcoming all obstacles ... and to being unstoppable! Preview "Coyote Power"
Joel Weldon's newest program - The 12-hour edition! Includes a Can of Success! You'll laugh, you'll cry, you'll be energized, uplifted and re-charged! Twelve hours of exciting ideas and over 150 inspiring true stories. Includes a Can of Success! 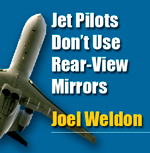 You'll love Joel Weldon's high energy delivery and practical ideas. No psychological mumbo-jumbo, no magic formulas. Just a realistic, common sense approach based on time-tested principles. "Sell it! 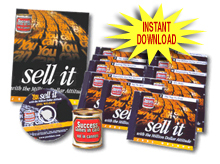 With The Million Dollar Attitude"
An exciting program from Joel Weldon, one of America's most sought-after Sales Trainers! Includes a 32-page Study Guide and a Can of Success! You'll find better prospects, build long-term relationships, handle tough objections and close more sales! If you understand completely what I am going to tell you, from this moment on, your life will never be the same again. This amazing message was first written for a group of salespeople at Earl Nightingale's insurance agency in 1956. They were utterly electrified. Word of it spread like wildfire, and everyone who heard it was positively ignited into action. Requests for a recording of the message came pouring in -- thousands of requests per week! Within no time, more than 200,000 people had called, written, or just walked right into Earl's office to request a copy. As years went by, that number soared above a million. 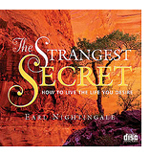 Today The Strangest Secret remains one of the most powerful and influential messages ever recorded. Set three thirty-day goals every month, one for yourself, one for your business, and one for your family, and make steady progress in all aspects of your life. Whether you’re a supervisor, manager, top executive, or parent, you have to manage and motivate yourself and others. This 2-hour recording from 1980 is vintage Joel Weldon, packed with ideas that can still help you today to lead and manage your team more effectively, and get the positive results you want.